Japanese Episode DP 144: "A Dungeon Capture!? The Valley's Power Plant!" American Episode 1239: "Gone with the Windworks!" In a grassy field, everyone gathers around Hikari to admire her new Hinoarashi. Satoshi suggests she has it participate in a battle to see what it can do and volunteers to have his Hayashigame be its opponent. Hikari accepts, and the two pokemon begin a training battle. As the battle goes on, Kotone's Marill wanders off. As soon as everyone notices that the pokemon is missing, they drop everything and start to look for it. After a short while, our heroes see the pokemon ducking into the Valley Power Plant. They go inside and, using the plant's security system, locate the water pokemon. Meanwhile, the Rocket-Dan break into the same plant to charge up their newest mecha. The power needed to charge the robot overloads the plant's generators, causing its emergency locks to activate. Satoshi-tachi find themselves sealed inside a storage room, so they send their pokemon out to restore the power and set them free. As our heroes wait to be rescued, Kotone and Kazunari get to know Satoshi and his friends a little better. 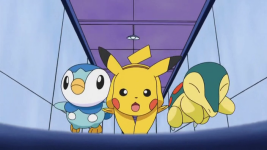 Eventually, Pikachu, Potchama, and Hinoarashi find the Rocket-Dan and fight them off inside the control room. Pikachu's attacks inadvertently recharge the plant's generators, unlocking the doors and allowing everyone to escape. 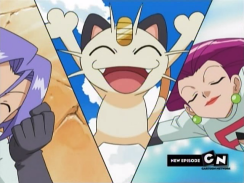 After Kotone retrieves her Marill, our heroes leave the power plant only to be confronted by the Rocket-Dan again! After Satoshi and his friends make quick work of the trio's surprisingly weak robot, they continue their journey toward Suiren Town. I thought this was an alright episode. It wasn't my favorite, but it wasn't too terrible, either. We get to see Hinoarashi have its first battle, a location from the games, Kotone probe Hikari about her relationship to Satoshi, a rare appearance by Kirinriki, and Sonansu actually doing something. I also really liked how being stuck in that storage room kind of forced some characterization to creep its way into the episode. Seeing these characters talk about other humans instead of always blabbing on about pokemon this and attack that was really refreshing. It almost felt like this show featured real humans or something. There were a few issues I had with the episode, though. The rivalry between Potchama and Hinoarashi seemed kind of pointless and ended up making the little penguin pokemon look like a douche. Hayashigame's CGI Rock Climb looked cheap and terrible. That biscuit scene was the biggest waste of time ever. The episode ended way too abruptly. But despite all that, I still thought it was a decent enough effort. Come on, Cartoon Network; James' face deserves better than that. Kirinriki keeps its Japanese voice. 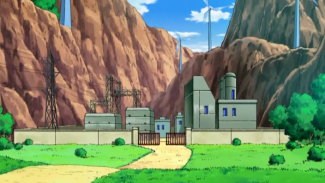 The stage of this episode is the Valley Power Plant, known as "Valley Windworks" in the English version. It doesn't seem to be the same place that was featured in DP 028, "Fuwante and the Messenger of the Northern Wind!" You see, in the Japanese version, the place where Mai's and Sayaka's father worked was simply referred to as the hatsudensho ("power plant"). The Japanese term for what we call the Valley Windworks, tanima no hatsudensho, is never used to refer to the place in the original. It's just "power plant." The dub, however, decided to rename that place Valley Windworks. 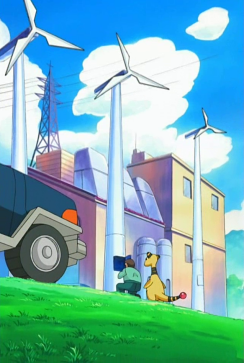 It makes sense, I guess; the plant in that episode was associated with Drifloon, it's located around the same area, more or less, and it has big windmills. However, that doesn't change the fact that the Japanese version never once refers to it as the "Valley Power Plant." So here we are, 116 episodes (114 for the dub) later. The place in this episode is, very specifically, referred to by its game location name in both the Japanese and the English version. 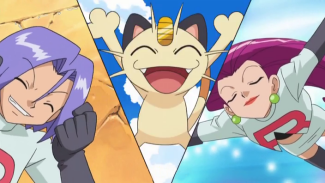 So in the dub, this episode takes place at the same place as that Drifloon episode while in Japan, a similar connection doesn't exist. Khoury: "It's the Valley Windworks." Ash: "Oh, the Valley Windworks." Originally, Satoshi poses his response as a question, as if to confirm what Kazunari had just said. In the dub, however, it sounds like Ash already knew what it was. Jessie: "How long do you think it will take 'til we're fully juiced up?" James: "Several hours, if Magnemite don't charge us." In the Japanese version, Kojirou is more specific and tells Musashi that it'll take three hours.